In my first week of being in Melbourne, two Chinese contemporary art minds finally collided in the right space at the right time. I finally got to meet Luise Guest, Director of Education and Research at White Rabbit Collection, Sydney, who was in the city for the opening of the exhibition ‘One Man’ by Liu Zhuoquan at Niagara Galleries. I’ve followed Luise’s research for many years now (mainly through her incredible blog), but have never had the chance to meet her in real life, as is the case with many international colleagues in the field, conversations mainly unfold online. After a very full-on day at RMIT University for the conference ‘Transnational Mobility in the Asia Pacific: Family, Friends, Facebook, I wandered through the city, through Federation Square to Birrarung Marr Park by the Yarra River, across the William Barak Bridge to Melbourne Cricket Ground, until I arrived in Richmond. With the glorious Spring sun beating down on me (wearing too many layers – it’s either too many or too little as the weather is insanely changeable here), I walked across the William Barak Bridge to be pleasantly surprised by a wordic feast for the ears…a piece of sound art that travelled with me as I walked above the highway. Called ‘Proximities’, it is a soundscape originally commissioned for the 2006 Commonwealth Games created by Sonia Leber and David Chesworth in collaboration with Simeon Nelson. Defined as ‘a sonic corridor of human voices’, it shares recordings of people from the 53 Commonwealth nations who are now living in Australia, as they speak of local histories and global entanglements. It completely captivated me to the extent I was very bothered why other people weren’t stopping or slow-walking to take it all in. A great video of the piece can be seen on the project’s webpage here. For some reason, I took no photographs, instead enjoying it for the experience (quite unlike me not to take photos!) whilst questioning whether this was a true reflection of what Australia “sounds” like. A hidden gem and a real aural introduction to this incredible city beyond its white noise. ‘Proximities’ (2006) on William Barak Bridge. Image courtesy of Leber, Chesworth and Nelson. Niagara Galleries is a two-storey commercial space where Liu’s work is on show in the upstairs gallery. 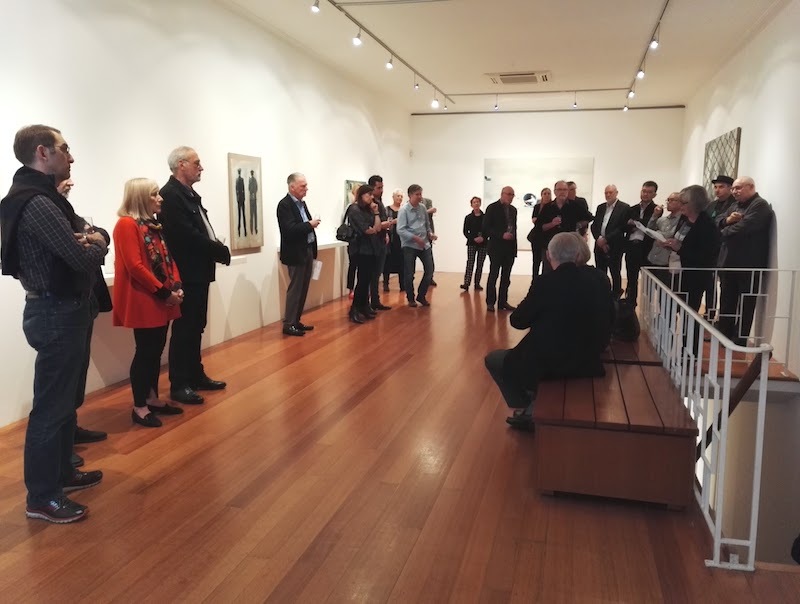 As Luise has known the artist for many years actually meeting him on her first trip to China, she was invited by the gallery to write the main catalogue text and give an informal talk at the exhibition opening. Alongside finally meeting Luise, I was introduced to artist Tony Scott, renowned in the field of Chinese arts, and co-founder of China Art Projects in Hong Kong. Again, someone I knew a lot about but have never had the chance to meet. Tony, I look forward to talking more when I’m next in Asia! Here are some notes (only the bullet points and quotations) I noted down from Luise’s very intuitive talk into Liu Zhuoquan’s work, where a more comprehensive insight can be read on a her blog here. The work of mature artist come into his own…brave work. I met him on my 1st trip to China….I was in shock and awe of Beijing art world at that time. I was just beginning to understand how Chinese artists were creating a new visual language. Artists in China were in a process of reinvention. Trained as a painter, he found the ancient art of “neihua”, painting inside bottles, that was popular in the Qing dynasty. He alludes in subtle ways to the Cultural Revolution. He sees his studio as a laboratory. I see him as an alchemist, a social commentary. A studio lined with bottles…inside the snuff bottles were a small universe…applied with skill and precise detailing. He is influenced by 8 years of living in Tibet and Tibetan Buddhism, also showing imagery of Cultural Revolution and government force, the misuse and abuse of power. The works are not just about China, they are global issues. The omnipresence of social media allows for art to be communicated in different ways. This is not just about China. Many artists feel a responsibility to talk about the uncomfortable truths, Liu is one of those artists. He’s now pushing his visual language of bottles, more expressive techniques and brushwork on the outside of the bottle and on more conventional surfaces. His use of bottles dates back to early child, an early affection of chemistry bottles with references to pharmacology in his work…self-medication. On first viewing, I saw Liu’s works as subtle statements not only on a personal history unique to the artist but a lonesome journey collective to the Chinese population – a grappling of tensions within the conflicted socio-political space of Mainland China and its diaspora. The detailed nature of the “neihua” process indicates a curious, intimate engagement with his materials and subject matter, and more so identifying a want and need to preserve traditional art-making techniques that are near-destined to be lost in today’s day and age. Liu contorts tradition and politics in a new contemporary mindset, presenting viewers with an insight into his recollection of his world. One of Luise’s closing sentences (a quote from Liu Zhuoquan) really captured the essence of his practice (stated below), what I see as a unique presentation of Chinese ambiguity waiting to be unlocked and translated by the viewer. ‘One Man’ by Liu Zhuoquan is on show at Niagara Galleries until 26 November 2016.